A debut from Plinth this week. About a dozen numbered clues and a load of unnumbered ones… that weren’t in alphabetical order. Oh dear! What’s more, each of the four quadrants of the grid was conected to its neighbour by only one entry. I hoped this wouldn’t cause too many problems. The numbered clues were relatively straightforward. Across we had 4 ELI•• (turned out to be George ELIOT), 5 DRUIDIC, 7 KISLEV, 8 ANODES and 10 TRIOR. The one that stumped me until much later was the excellent 11 Put back stopper on claret that’s turned and last of Sauternes (7) and was DERNIER: REIN< (stopper!) on RED<, defined by ‘last of Sauternes’, France. I got three of the downs as 1 LIAISES, 2 OLOGY and 6 SLOVENIA, although I couldn’t find the river (turned out to be SLAVONIA!). On to the unnumbered clues. They also came fairly quickly, and when I got to 13 AGAMOID and 15 EMAILED it looked as though they could intersect in the top left corner, so I pencilled them in lightly. A few minutes later came 18 ORDINARIES and I could slot that into column 2 since KISLEV forbade it in column 11. After that, everything went fairly easily and the grid was finished in under a couple of hours. The mysterious ‘fragment of text’ eluded me for quite a time during the solving process since it seemed to be gobbledegook. However, once I had got honor…, a quick check in Chambers showed honorificabilitudinity with the etymology revealing ‘LL honorificabilitudinitas, preserved in the ablative pl honorificabilitudinitatibus as a superlatively long word, in Shakespeare, Love’s Labour Lost V.1.37 and elsewhere‘. Where the elsewhere was, I never found out. This finally helped me to clear up clue 7 Drummer internalising anger makes more hell (5) which had obviously been DIRER, but almost seemed to have no misprint. It turned out that a definition under fell3 was ‘dire’. … but this left me none the wiser! Now Brewer’s has some weird entries (although the preamble didn’t mention it as a useful reference), so I looked up ‘honor…tatibus’. I was rewarded with an entry which described how Sir Edwin Durning-Lawrence supported the theory that attributed Shakespeare’s works to Francis Bacon. He even discovered that the long word was an anagram of Hi ludi F Baconis nati tuiti orbi. Even my basic schoolboy Latin could see that this was the translation of ‘These plays, F Bacon’s offspring, are preserved for the whole world’! John Sladek, an American science fiction author also ‘proved’ that Ben Jonson wrote Shakespeare since the word is also an anagram of I, B. Ionsonii, uurit [writ] a lift’d batch! All that was left was to change W SHAKESPEARE in the bottom row to FRANCIS BACON and highlight the thematic phrase, symmetrically disposed. My first thought was LOVES LABOUR’S LOST, MESS FRANCIS BACON, but it seemed a bit odd to use Mess, meaning ‘master’. 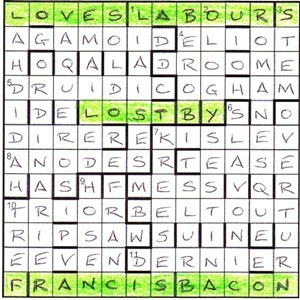 It was only as I used my marker pen to highlight LOVES LABOUR’S LOST that I noticed BY next door, so it was BY FRANCIS BACON. So thanks to Plinth for an enjoyable puzzle and its fascinating revelation. This entry was posted on 28 June 2013 at 4:00 pm	and is filed under Solving Blogs. You can follow any responses to this entry through the RSS 2.0 feed. You can leave a response, or trackback from your own site.